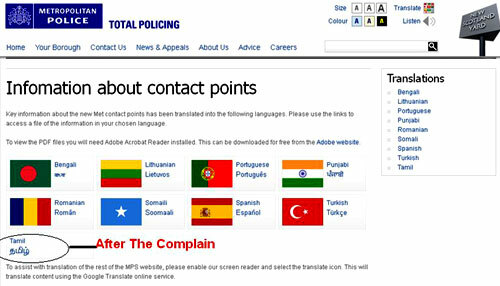 The Metropolitan Police of London were embarrassed today (11 September) by mistakenly publishing Tamil Tiger flag in its web site in section under ‘Information about contact points’ (http://www.met.police.uk/contact_points/). This particular web page contains the key information about the new Met contact points translated into few languages such as Bengali (Bangladesh), Lithuanian, Portuguese (Portugal), Punjabi (India), Romanian, Somali, Spanish (Spain), Turkish (Turkey) and Tamil. 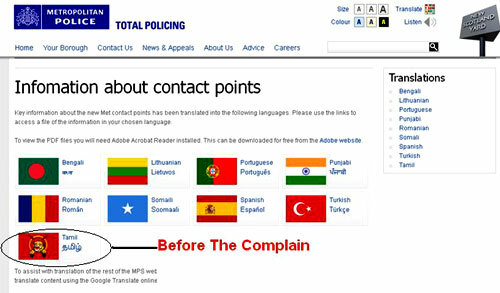 To highlight those languages the Met Police web has used respective country flags but for Tamil language they have used the Tamil Tiger flag. After lodging a complaint by the President of British Sri Lankan Forum about this grave mistake done by the Met Police, the relevant authority has taken prompt actions to remove the flag from its web site, but no explanation has been given yet. President of the British Sri Lankan Forum, Janaka Alahapperuma said he had to make phone calls since this morning from 8.00am to explain this serious mistake done by the Met Police and had to give all the information including the location they have displayed the tiger flag. Mr Alahapperuma further noted that no one has informed them till that point according to the information he received and so he had to lodge a formal complaint to the Met Police and Scotland Yard. And Mr Alahapperuma said Met Police will send him an official reply even though they took immediate action to remove the flag. Mr Alahapperuma also thanked the young journalist of LankaCnews in Sri Lanka for alerting him through an influential Buddhist monk who is currently in the UK. He said that their organisation receives huge support from fellow Sri Lankans including the Tamil community to continue the patriotic work in the UK. Liberation Tigers of Tamil Eelam (LTTE) commonly known as Tamil Tigers is a proscribed terrorist organisation in the UK. In many occasions London Met Police have arrested LTTE members for displaying material which supports a proscribed organization in the United Kingdom. Most of the time they were arrested under Section 13 of the UK Terrorism Act for blatantly displaying or carrying the fascist terrorist flags, the leaping ferocious Tiger of their outfit, displaying material in support of LTTE terrorist group or their violent behaviour.